Three sets of vertical banners featuring a Santa at full stride recently went up on Highway 9 north of Breckenridge by Valley Brook Road. The banners are some of the first unfurled by the town as it looks to start a new, regular rotation of banners promoting both the town as a whole and some of the more fun happenings here. Drivers approaching Breckenridge from the north on Saturday passed three dashing Santas and a trio of Christmas trees, just as the town was preparing for two of its signature Christmastime events. The colorful cartoon images are displayed on six new sets of median banners along Highway 9 recently unfurled by the town, and the tannenbaums and portly man in red running at full stride are just the beginning of a bigger push to beautify the main thoroughfares leading into town. 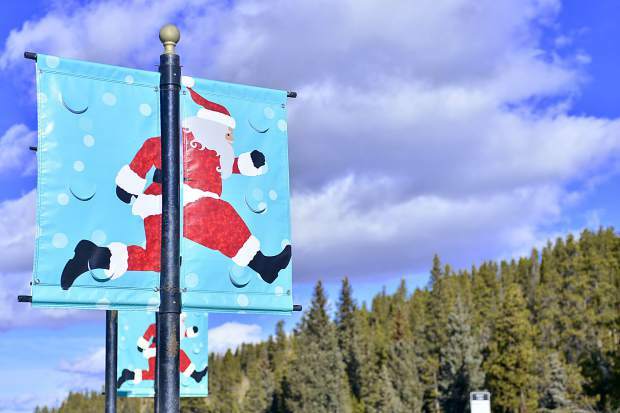 The new banners catch drivers coming from Frisco on the highway just south of Valley Brook Road before downtown, and they arrived just in time for the town’s annual Race of the Santas and the Lighting of Breckenridge, both on Saturday. The six sets of vertical median banners are only the first additions of what’s to become a regular rotation of new banners promoting the town in general, as well as some of its most iconic happenings, like Ullr Fest. As part of the Highway 9 Median Beautification Project, poles were put in place along the median to hang flower baskets from throughout the summer season, generally early June through mid-September. The banners are to be hung the remaining nine months of the year, according to the memo. In addition to background information, the memo also provided early cost estimates and some things for Breckenridge Town Council to consider, including one federal regulation relayed through the Colorado Department of Transportation forbidding the banners from being direct advertisements. As a result, the event-specific banners aren’t directly advertising anything, per se, but many will feature images that go hand-in-hand with some of the town’s signature events, such as a Viking helmet for Ullr Fest, a popular annual celebration in Breckenridge that pays homage to the Norse god of snow. At one point, town staff negotiated to purchase the rights to use a number of local photos in the median banners for a “minimal fee,” but that idea was later scrapped in favor of easier-to-read graphic images. Because the banners will be most often viewed by people riding in automobiles, town staff decided “big, simple” was the best way to go, according to the February memo, and many of the images will be repeated across multiple banners for consistency in branding’s sake. The new median banners shouldn’t be confused with the large streamers that frequently stretch across Main Street at Lincoln Avenue also promoting numerous events in Breckenridge. That placement can be reserved no more than six months in advance through a separate town-sponsored program by filling out an application and getting it approved by town staff. Additionally, the town’s new communications coordinator, Haley Littleton, recently presented council with a couple options for some more banners at a Nov. 28 work session. Others proposed feature a single word — like Live, Work, Play or Explore — along with a monochromatic graphic representing that word to promote the wide variety of recreational, cultural, historical, dining and shopping opportunities here. “The total cost for one round of banners will be about $5,150,” according to a Sept. 20 memo from Littleton to council that further breaks down the figure with an estimated $2,000 for design, about $1,500 for installation and $1,650 to produce each set of vertical banners, without any duplicates. In the memo, town staff recommended three rounds of banner designs each year, including one in the fall, winter and spring.